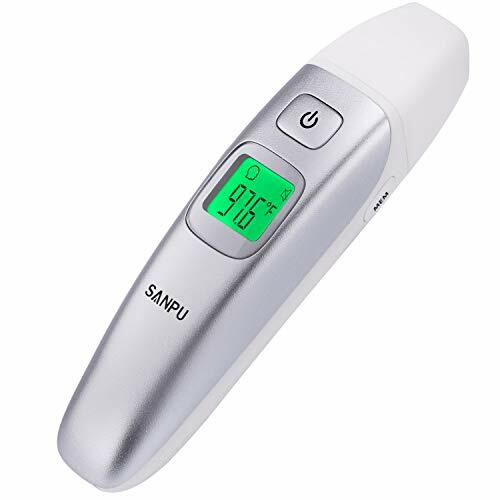 SANPU Digital Medical Infrared Forehead and Ear Thermometer is currently selling at $10.99, approximately $0.09 lower than average, giving a potential saving of $29.00 right now. With a lowest price of $10.99 and an average of $11.08 it is selling on the low end of its usual range. Price volatility is 0.59% (meaning it does not change often), so the price should stay low for a while. Right now this product is a recommended 'good deal'. The current deal is also the best price on this item over the last month. 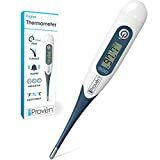 Compare the current price, savings (in dollars & percent) and Buy Ratings for the top Digital Thermometers that are closely related to SANPU Digital Medical Infrared Forehead and Ear Thermometer. Here is how SANPU Digital Medical Infrared Forehead and Ear Thermometer compares with other leading Digital Thermometers. The Product Features of FDA ThermometerMultl - mode: Forehead/Ear and Object Surface Temperature MeasurementAccuracy and Reliability: Advanced infrared temperature sensor, with high sensitivityFast and Easy:One button measurement only 1-second Diverse functions?1-20 reading recalled2-Fever alert3-Switching between ºC and ºF4-Automatic power-off, power savingNote: 1) Please keep this Dual Mode infrared thermometer out of Children's reach. 2) Medical assistance can't be replaced by the use of infrared Dual mode infrared thermometer. 3) The Dual mode infrared thermometer is not waterproof! Keep it away from water. 4) It is NORMAL to get the variations between Oral (0.5 to 1.0°F), Forehead (0.3 to 0.5°F) and Ear measurements. This is NOT due to the inaccuracy of the thermometer. 5) When forehead and the ear temperature is 37.6°C/99.6°F-42.2°C/108.0°F, there will be 3 short double beepsand a red backlight.Red backlight indicates that the body temperature is a little high.You may have a fever. 6)Ear test mode is only suitable for children over 3 months. It is normal to obtain a slight variation in temperature readings when taking temperatures from different parts of the body. It is dangerous to make a self-diagnosis or self-treatment based on the obtained measurement results. For such purposes, please consult a doctor. Please read the included instruction manual carefully to avoid any misuse and keep it for future reference. Package Contents 1 pcs SANPU Infrared Thermometer 1 pcs Portable Case 2 pcs Battery (AAA) 1 pcs Instruction Manual FeaturesCLINICAL ACCURACY and RELIABILITY: Equipped with the most advanced medical infrared technology for accuracy and reliability. Recommended by medical experts following its vigorous FDA clinical tests to confirm its consistency and reliability.MULTI - MODE: Forehead Thermometer (suitable for all ages) , Ear Thermometer Function (only for the child above 3 months) and Object Surface Temperature Measurement. E.g- use it to measure milk, water temperature.AST AND EASY: One button measurement,provides fast clinical accurate instant temperature within 1 second and precise reading. A loud beep will notify you it is done.In addition- "MEM"button to switching from ?/°C or °C /?.READING RETRIEVAL STORE: Thermometer can store and recall up to 20 readings for baby and adults, available to help you track the trend of body temperature.